Another year is ending. 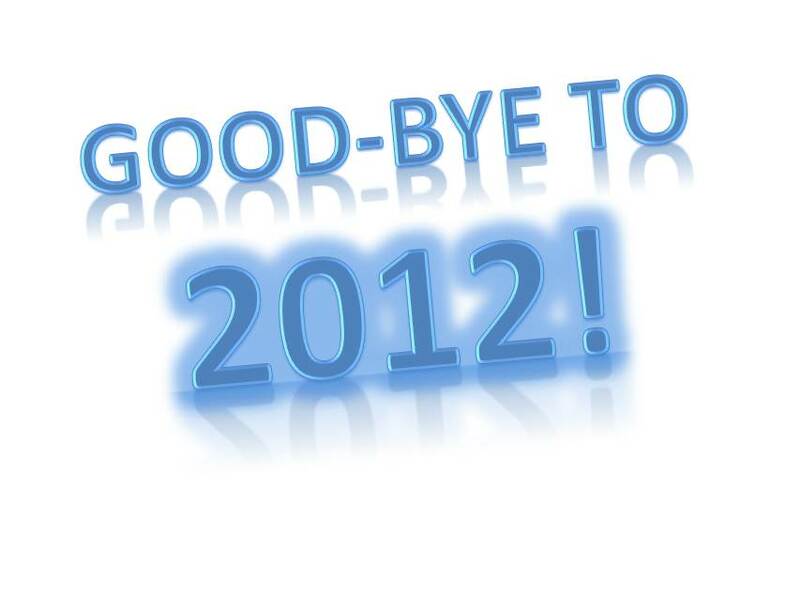 It is a day to take stock of what has happened in the past year….and put off goal setting (i. e. resolutions) for the 2013 until tomorrow. I started out 2012 knowing that it would be a transition year - from working for a big corporation to doing whatever I pleased and could afford. Some of my plans for the year did make it to reality. I posted to my blog every day and did a lot of writing ‘practice.’ Career and corporate related reading declined; the other topics increased to fill the gap. Most of my travel was planned early in the year and happened as planned - Shenandoah in the spring, Tennessee in early summer, Colorado in late summer, and New York for fall foliage. All the trips were enjoyable and kept me from getting too comfortable on home turf. There was serendipity along the way as well: watching the heron cam at Sapsucker Woods for hours, attending a Women in Computing conference in Baltimore, volunteering for the Friends group of a local nature center, planting trees and cutting kudzu in a watershed, taking my first Coursera course and participating in the National Novel Writing month. Toward the end of the year I found myself in Texas caring for an older relative and learning more about hospitals, atrial fibrillation, and hematomas than I ever thought possible. 2012 has lived up to my expectation of it being a transition year. I am going to start thinking more about what my expectation is for 2013 for my blog post tomorrow. My initial thought is that the variety I created for myself in 2012 is something I want to continue! I spent December 2012 away from home. 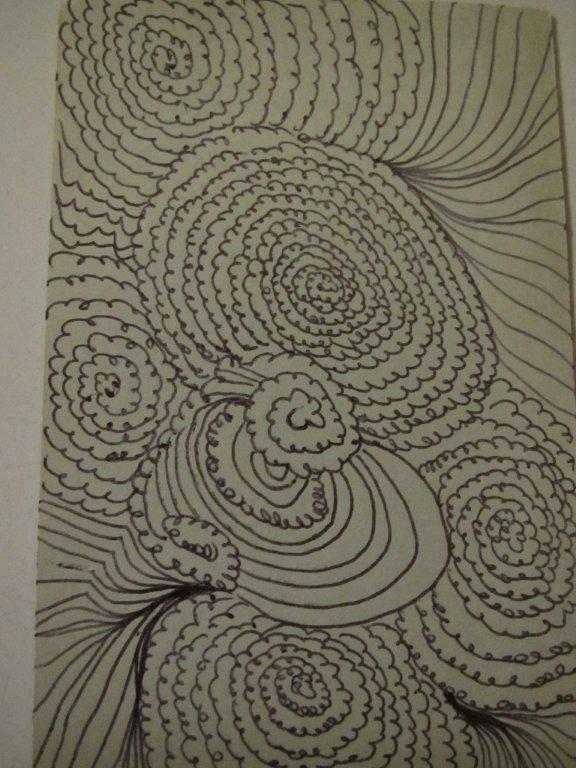 Doodling was a tried and true way to reduce stress and regain objectivity during the trauma and drama of hospitals, holidays, and family. 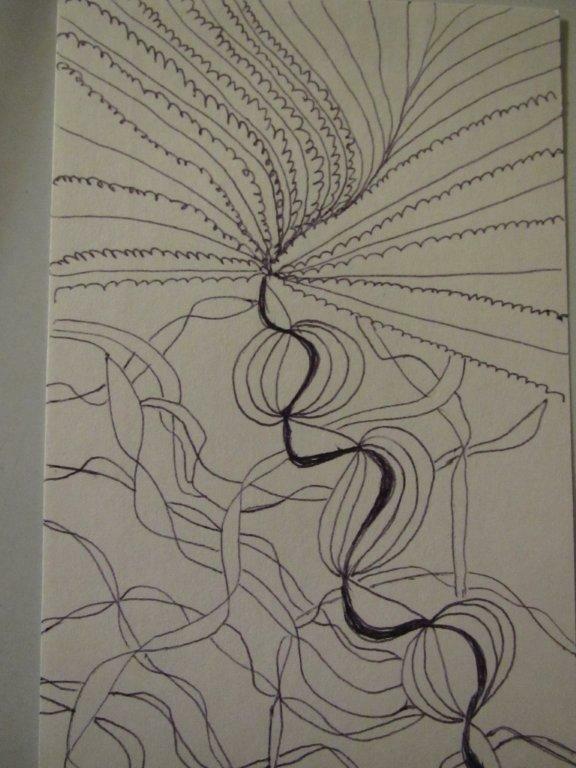 Most of the doodles were done on 3x5 note cards using the back of Kleenex box as a writing surface. Enjoy the December 2012 doodles below! Doodle posts for previous months are here. 2013: Hello. Goodbye. - from Richard Watson. How many things on the goodbye list are already gone for you? Is Your Fridge Eating your Savings? These images were captured on a recent trip to a cemetery to put a wreath on my grandparent’s grave. 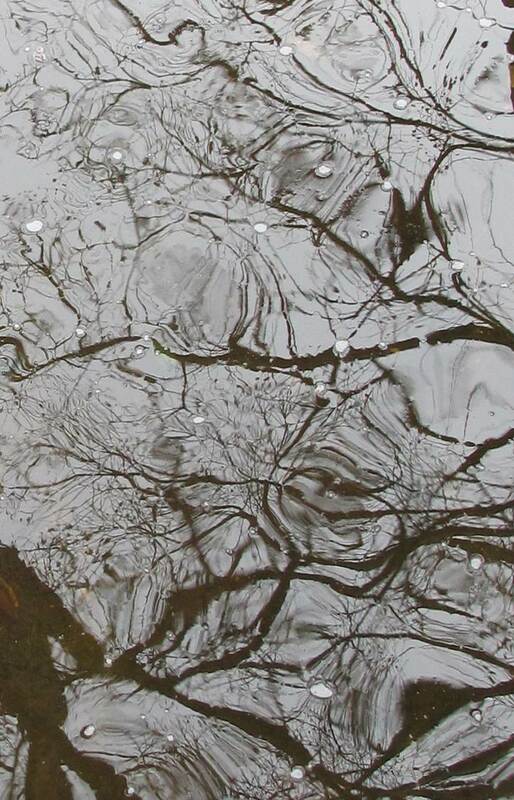 The lighting was perfect for capturing reflections on a water surface; the distortion is from the movement of the water, the breeze, and the debris floating on the surface. 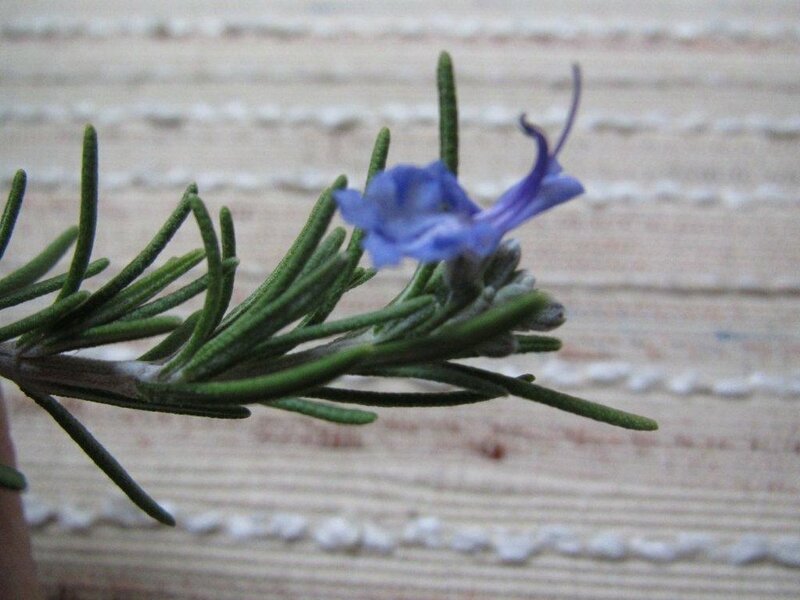 My parent’s garden has a rosemary bush. It has survived Texas drought and ice storms to bloom in December. I noticed the blooms when I went to cut some springs to put in a soup. They are small and located on the very ends of the branches; it is a bush that decorates itself for the holidays. 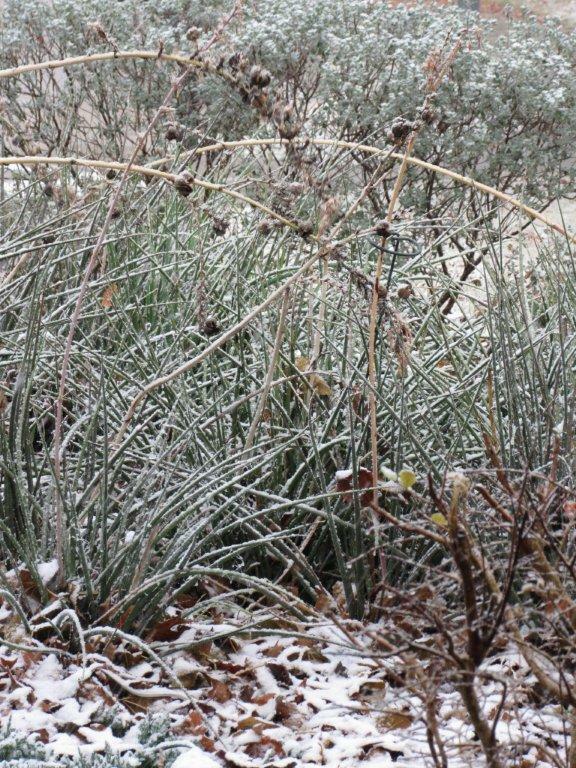 Dallas, Texas does not get snow frequently and it is usually in the early months of the year rather than December. So - it was cause for celebration and picture taking when it snowed yesterday! 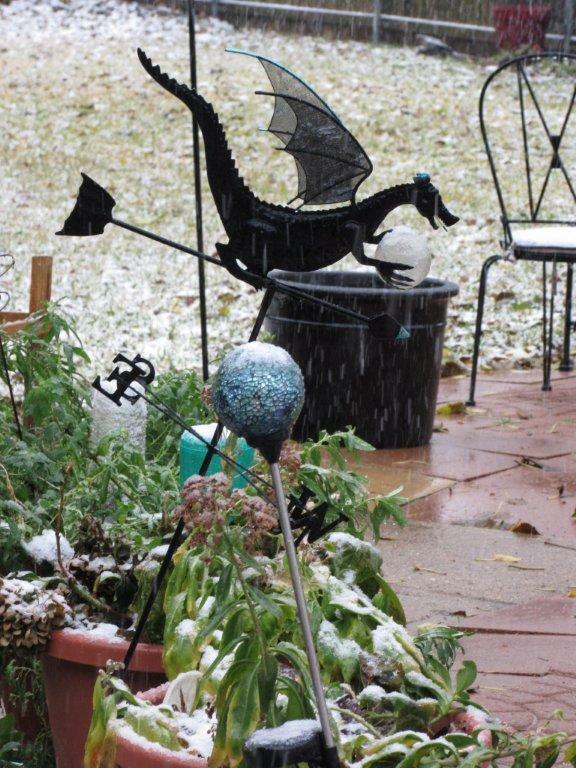 Enjoy the slide show of the dusting of the white stuff! My Christmases have always been full of family and food and gift exchanges. This year is no exception but the tenor of the holiday is different. After spending weeks where every spare moment was at a hospital - the family scurried to get gifts bought and wrapped in the few days between the release from the hospital and Christmas. It will be a low key celebration instead of the usual big dinners with the whole family. We are aiming for smaller groups and simpler foods. And we all don’t need to count to know that we have been truly blessed this year. 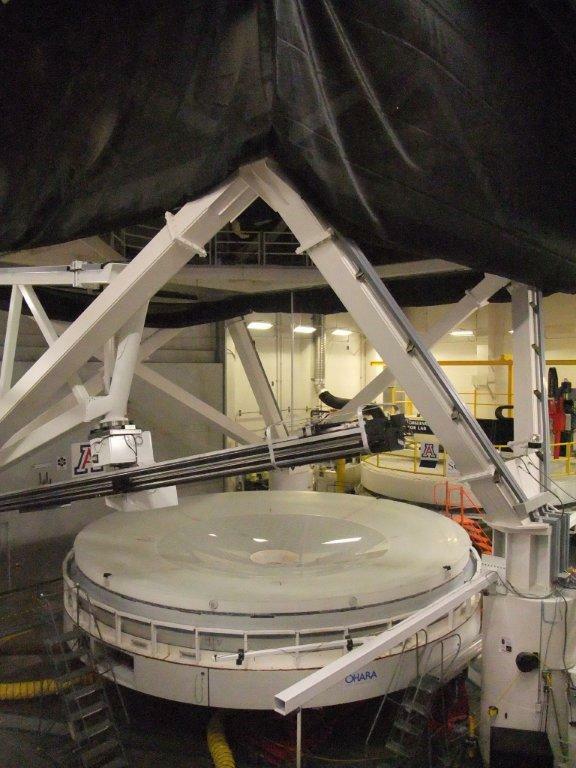 My daughter sent some pictures from a recent tour of the Steward Observatory Mirror Lab at University of Arizona where she is a graduate student. The ease that we can take and send pictures now makes it so much easier to share experiences across distances. The picture at the left has some orange stairs toward the right of mirror being constructed; they give some concept of the scale of the place. These are large mirrors! The mirrors are made of borosilicate glass - which is what Pyrex used to be before the 1980s. At the very last their reflective surface will be coated with aluminum. See the slide show below for other pictures of the lab. After spending my recent nights sleeping on a hospital rollaway - seeing this sunrise on the 22nd after sleeping in a regular bed became a milestone on my transition back to ‘normal’. Somehow being able to walk outside to take the picture rather than seeing the sunrise through a hospital window as I had earlier in the month became an inflection point in my thinking. I could relax a little and savor the day. National Park Photography - From National Parks Traveler. There are links to the photographers’ sites. Blood vessels of a healthy mouse retina - it could be abstract art! Tomorrow is the hundredth anniversary of Lady Bird Johnson’s birth. I’ve been reminded of it by the stamps issued in her honor by the US Post Office. But today I am thinking about what I remember over the years about Lady Bird. Of course - my impressions are through the veil of the way the media portrayed her….but they are overwhelmingly positive. When I read her A White House Diary, her interests and approach to problems seemed so rational. 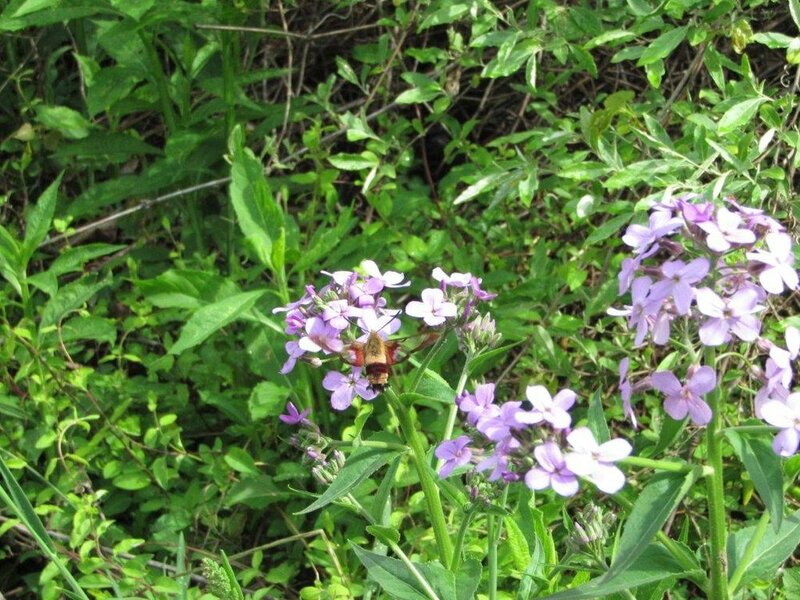 Every time I see wildflowers growing along a high way - the mowers avoiding cutting them before they go to seed - I think of her. Her advocacy to remove the eyesore of litter and excessive billboards has been so long lasting that many people in our country don’t really remember that ugly aspect of 60s. So - here’s to legacy of Lady Bird Johnson. The last of the tomatoes have been harvested from my parents’ garden near Dallas, Texas. Some of them will make it to ripeness laying out on a paper towel in the garden room of the house….little remnants of summer in December. There is a poinsettia on the table beside them. Today I am celebrating tomatoes as part of our Christmas decorations! 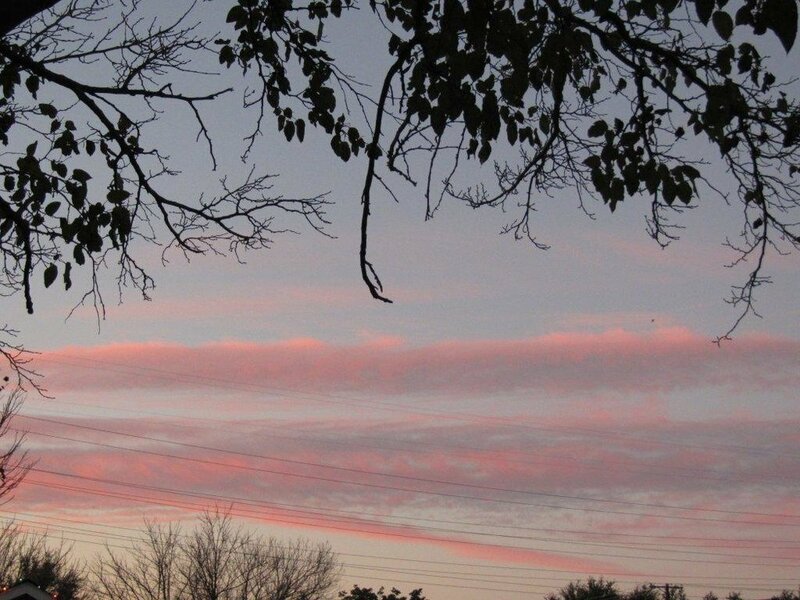 The shorter days of November and December provide an excellent chance to catch the sunrise. I captured one in Maryland back in November. 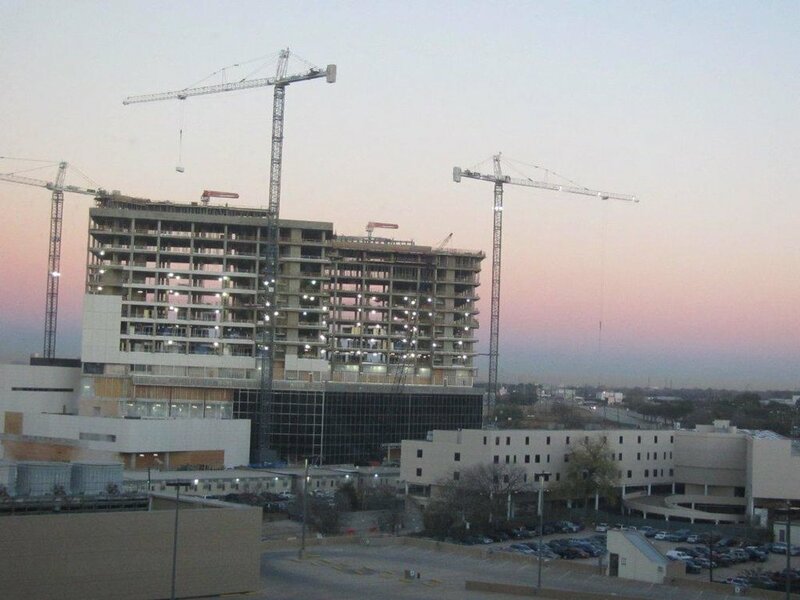 The picture in this post is the sunrise from the hospital window in Texas captured yesterday. All three construction cranes were active. In the earlier darkness their motion had been visible but the people working on the building were not visible until the morning light. 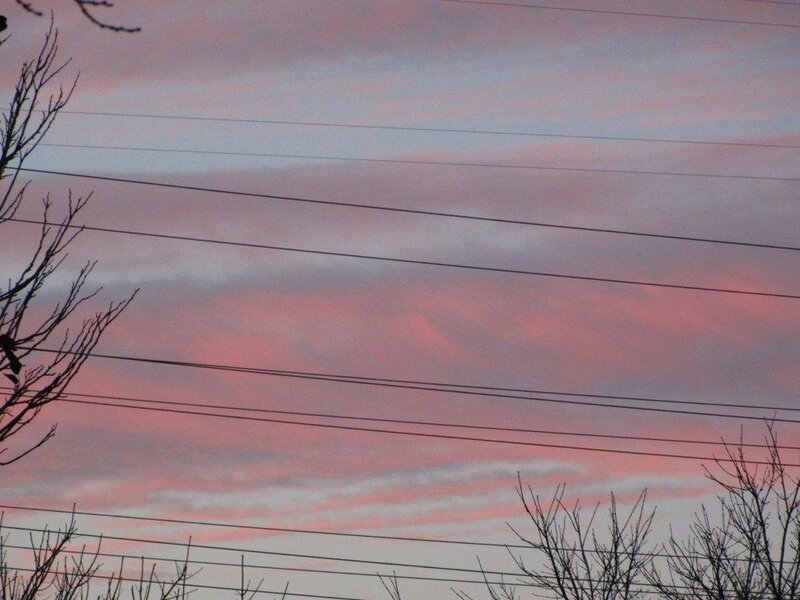 I liked the effect of the layer at the ground being very blue … and then the layer of pink. It only lasted for a few minutes and then the layers washed away in the brighter daylight. It was the start of very good day. I am missing home today - having not been there at all this month (see hospital experiences blog posts). Nothing is ‘normal’ or ‘planned’ right now. It is hard to focus on more than getting through the next day or two. 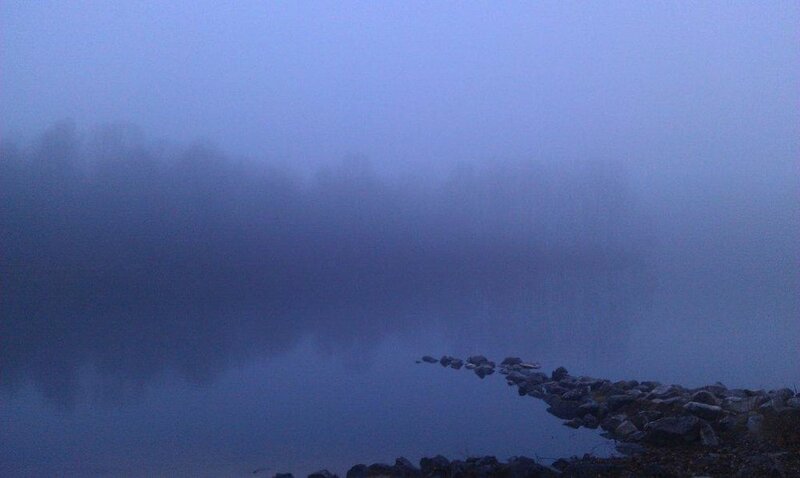 My husband sent me a picture of the fog at Centennial Lake yesterday. The almost masked trees across the lake - their reflection in the water - the stones of the boat launch….I know the place well. 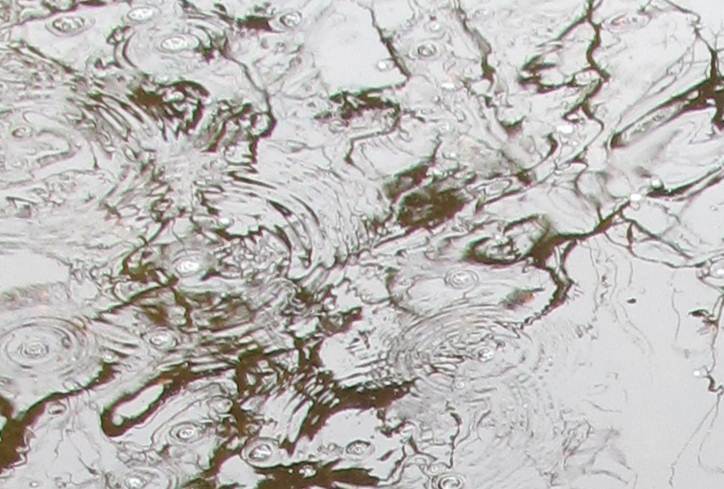 The image evokes a bubble of calm for me. I’ll find myself looking at it frequently over the next few days when I need to fortify my emotional reserves. Looking through a skylight provides a different perspective - a narrow vertical look upward. The boundlessness of the look straight up can be dizzying because there is nothing to grasp onto. Sometimes an overhanging tree provides a link to the horizontal view of the world that we take most of the time. Experiencing heavy rain or hail while standing under a skylight enables us to feel the power of weather while protected from its fury. Today I am celebrating the look upward to the sky! 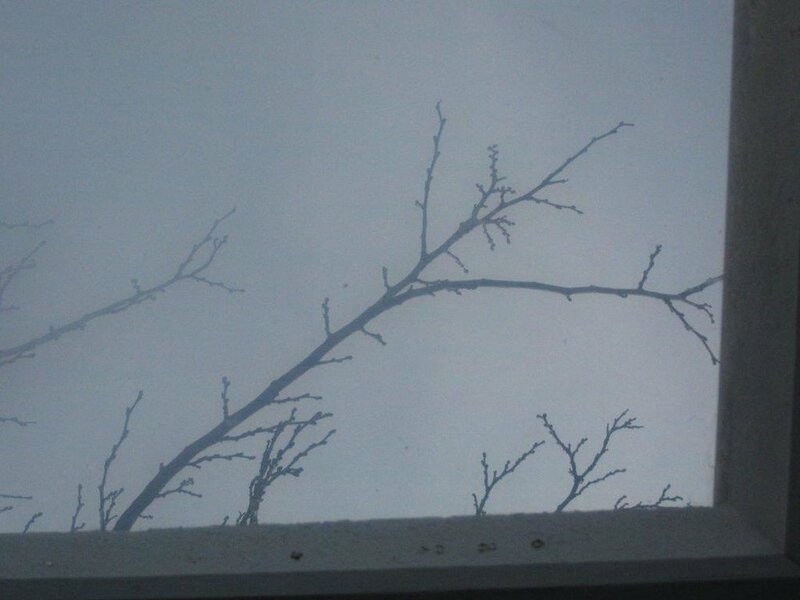 Maryland in December is the time for the trees to take on their winter starkness. 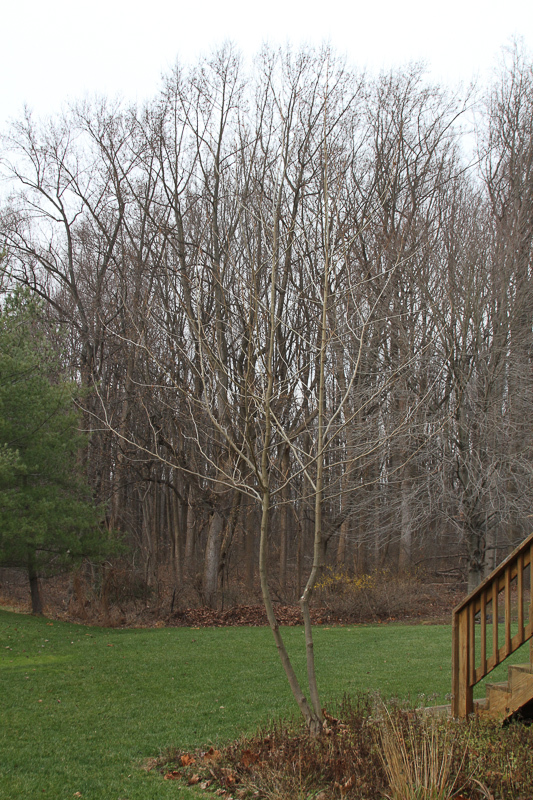 All the leaves are gone from the trees in the forest and the sycamore in our garden. 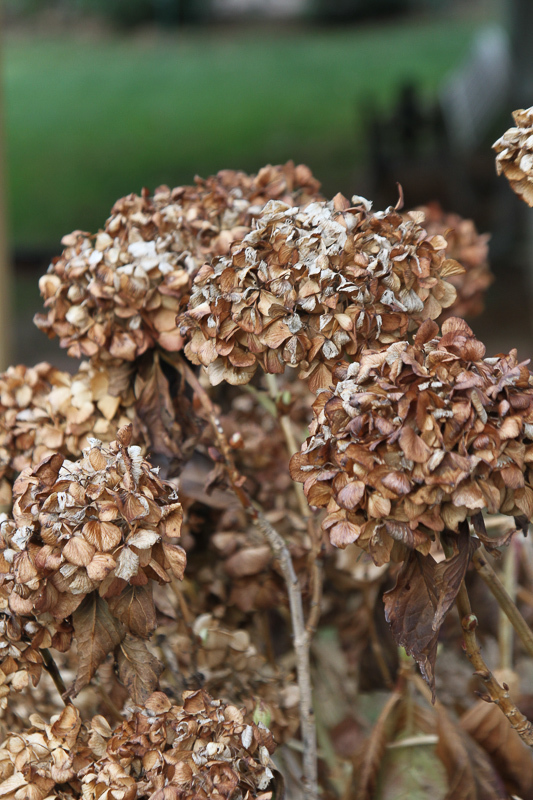 The dried hydrangea flowers have lost their pink color. 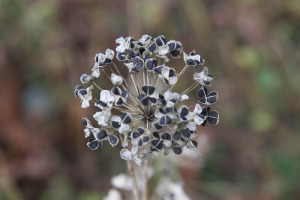 More of the onion seeds have been rattled out of their pods. 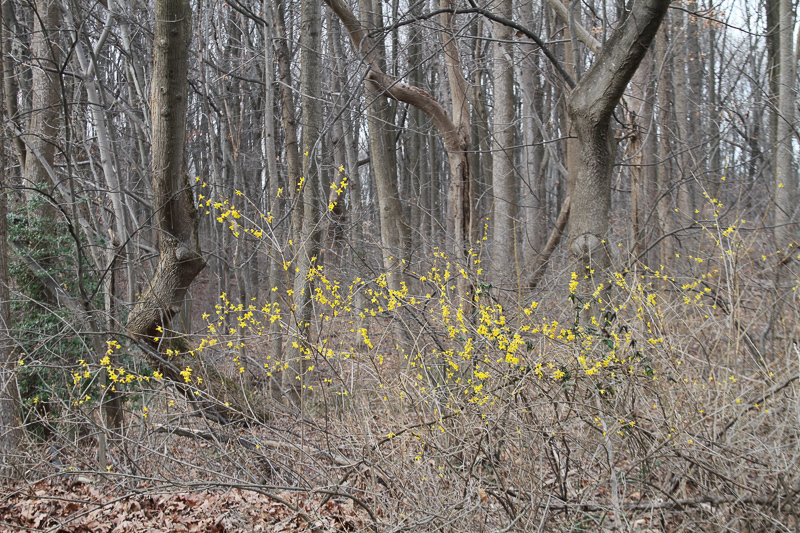 And the forsythia at the edge of the forest is a bit confused - blooming in the fall rather than its usual spring cycle. The Internet has a growing number of online books….and many of them are free. This is the third monthly post highlighting 3 that I have found within the past month. The Smithsonian American Art Museum and the Renwick Gallery have a number of online exhibitions available. The first one I looked at was Lino Tagliapietra in Retrospect: A Modern Renaissance in Italian Glass - but I am now working my way through others that look interesting. Miltoun, Francis. Italian highways and byways from a motor car. Boston: L.C. Page; 1909. Available at http://archive.org/details/italianhighwaysb00milt this book includes color and black/white illustrations that capture the essence of a road trip through Italy in the early 1900s. Paul May at the Bristol Chemistry Department Home Page has been posting a Molecule of the Month since 1996. Reading the postings for 2012 (or an earlier year) is a short book. Learn about the molecule that gives raspberries their smell and botulinum toxin (anti-wrinkle/neurotoxin). The previous eBook posts can be found here. This is the fifth post in a series with thoughts about my recent experience having an elderly family member in the hospital - focusing on how life continues on with that disruption. I am resting up for my shift at the hospital. Mine is the overnight one. Our family member is improving but we are not comfortable leaving her alone at the hospital for long periods of time. The mind muddling medications are becoming a thing of the past and we are gathering magazines, crossword puzzles, CDs, slide shows…..anything we can think of to stave off boredom for the patient and ourselves. She is not a person that watches a lot of television normally (television is usually the only diversion offered in the hospital rooms). The particular room she is in has a view of a construction project with three cranes being very active on the top of the emerging building (see previous post for a picture); we’ll have to position her reclining chair to take advantage of that view. This is one of the first experiences with an extended hospital stay for the family. While most of the care has happened at a pace in sync with our expectations - there is one area that always has problems (the patient has to wait a long time on a gurney or the procedure is cancelled at the last minute because a conflict with some other patient’s procedure has occurred). Being a technical person - I now see it as a process problem since the problem has occurred repeatedly and am seeking a way to communicate the observation to the hospital so that they can improve. Another issue is the coordination of care with multiple specialists. It does not appear that the primary doctor is always cognizant of what the specialists are doing and the specialists or not aware of each other either. It should not be up to the family to ask questions and insist that the care be coordinated. But that sometimes appears to be the case. 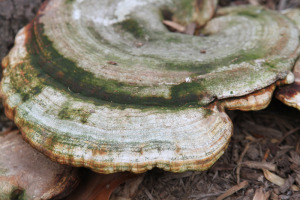 In general - our medial system appears to be a loose conglomerate of specialists treating illness rather than an integrated system toward health - or restoration of health. The skewing has become so acute that it is quite challenging for the patient (and the family) to understand the mental and physical actions that would move the patient toward a ‘healthiest they can be’ state. I enjoy taking a closer look at Christmas decorations. They have a different kind of beauty viewed in these macro imagees. Can you find the angel ornament's wing, the center of a poinsetta, a gold garland, and a Santa face in the slide show below?